Another long day, and aside from the joy of coming home to my husband (to-be), and the purring ministrations of our cat Milton, a late dinner and a glass of a lovely Argentinian blend (Cab-Malbec-Syrah), it is again poetry that soothes my soul, and calms me down. Like last night’s, this post, and possibly tomorrow’s will be on the short side, but I’ve been reading more and more by today’s poet lately, and I will likely read something more by her before Poetry Month is over. 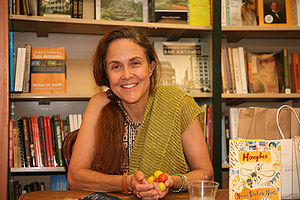 In the current literary scene, one of the most heartening influences is the work of Naomi Shihab Nye. Her poems combine transcendent liveliness and sparkle along with warmth and human insight. She is a champion of the literature of encouragement and heart. Reading her work enhances life. Nye has written, and or edited numerous volumes of poetry, and has even written songs and books for children and young adults. She was elected Chancellor of the Academy of American Poets in 2010. Most recently she was the winner of the Robert Creeley Award. Since I must keep commentary short tonight, I will direct you to a lovely in-depth write up on her at the Poetry Foundation. Here is my reading for Day 13 of National Poetry Month, “The Shape of Mouths at Parites,” by Naomi Shahib Nye. pounding out its own tale. carrying my own like an unpicked plum. does not need my “Oh really?” for his story to go on. and secretly converses with the rug, the dog, the air. David has been reading a poem a day for national poetry month–and this was so GORGEOUS, I need to share it. Well done. She’s a fave of mine. Thanks for linking to mine. Thank you, Jamie, and it was my pleasure. Really a fine ready of this wonderful poem.